Working with the sailing Olympic medallists and their coaches gave me surprising insights around increasing presence and performance. So many, that I had to write a book about it in 2017. I dedicated the book to my father who transferred his passion for sailing on to me. But it’s written in Dutch and I hope it will sell so well that the publisher Hollandia will translate it into English. The sailing headcoaches of the Netherlands and Belgium were impressed by the book. It gave them more insight in themselves and the campaigns they organised. Fasting for 4 days on top of a mountain in the Anza Borrego Desert made me realize that I am healthy again. I kept a journal to record feelings of misery and awe, my dreams and insights. 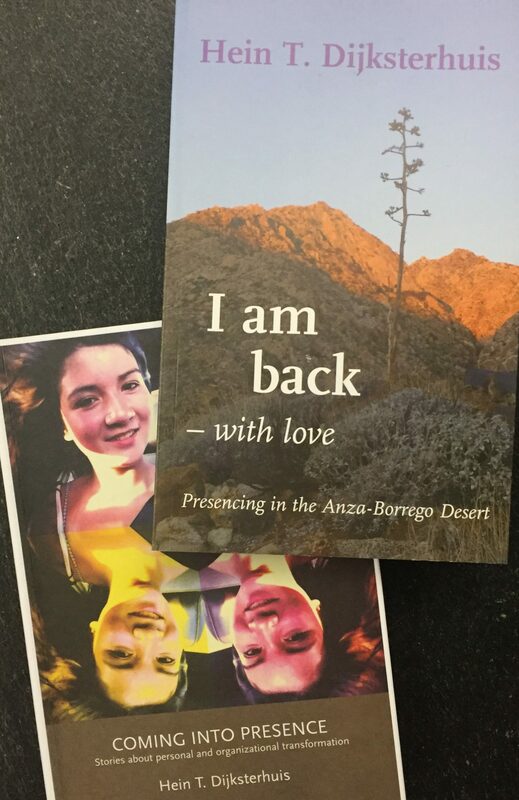 Back home I had to write it down properly and it resulted in my first book: “I am back – with Love”. It took me only a week, still full of natural energy. Together with my guru Joseph Jaworski (author of Synchronicity) I organized a book launch in de Rode Hoed in Amsterdam. He presented his book “Source” and I shared the story of “I am Back-with Love”. Over 300 people attended the meeting and I experienced what it was to be an author: cramped hand because of all the signatures. Together we gave a workshop afterwards to deepen our understanding of the inner development of the transformational change agent. This is the opening of my second book. It was published in 2014. I share my experiences of 10 years applying the U Process. One chapter is dealing with my personal story and how I dealt with my heart problems. In the second I describe how to use the U in strategy assignments for business clients. The third chapter was the most fun to write: it’s a dialogue between myself as a coach and an imaginary client. In between I share my insights about coaching and how to realize your full potential. The last chapter of the book is written with my colleagues of the Presencing Institute. We write about our experiences of a 2 year online peergroup coaching process that proved to be transformational for all of us. All books are available in the webshop of this website. During the past years I wrote blogs that you will find here in this site. I usually start with a photo and that brings the inspiration for the blogpost. You have a unique style of storytelling that is very engaging and connects to the reader. Isn’t it human to struggle the way you have… the way all of us do. You tell your story with humor; with great honesty and truth, in a way that connects your humanity to others. In facilitating leadership and innovation programs around the world with Hein, I witnessed his unique capacity to translate what it took to become world Champion in sailing into bringing out the best in people and organizations. His strategic clarity and his intuitive attunement to his team, his competitors and nature allowed him to steer a winning course in uncertain terrain. Whether we worked in Sri Lanka with the country’s leading social movement or with the top bankers in Europe or innovators in Brazil he proved not only to be a skillful professional but also a deep human being whose authentic humanity incites others to risk real change. With his new book, Hein gives the reader a detailed insight in how he coaches clients. The “verbatim” reports allow the reader to closely follow how “the story develops”. With this, Hein takes coaching to a next level. From now you’re a great author to me! You gave me the opportunity to travel with you, to sit on your shoulder, to share your thoughts and feelings during your courageous personal journey and writing process. And yes, you made it! “I’m back” is a very intimate story. After reading this I know for sure, the only choice I have is to follow my heart. Anyone on the planet can sense authenticity. This book is a beautiful and inspiring example.